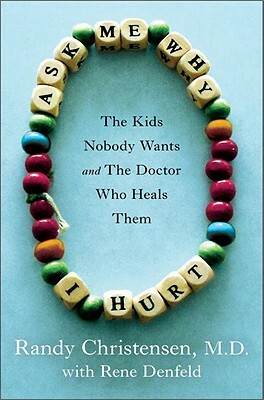 The unforgettable inspiring memoir of one extraordinary doctor who is saving lives in a most unconventional way Ask Me Why I Hurt is the touching and revealing first-person account of the remarkable work of Dr. Randy Christensen. Trained as a pediatrician, he works not in a typical hospital setting but, rather, in a 38-foot Winnebago that has been refitted as a doctor’s office on wheels. His patients are the city’s homeless adolescents and children. In the shadow of one affluent American city, Dr. Christensen has dedicated his life to caring for society's throwaway kids—the often-abused, unloved children who live on the streets without access to proper health care, all the while fending off constant threats from thugs, gangs, pimps, and other predators. With the Winnebago as his moveable medical center, Christensen and his team travel around the outskirts of Phoenix, attending to the children and teens who need him most. With tenderness and humor, Dr. Christensen chronicles everything from the struggles of the van’s early beginnings, to the support system it became for the kids, and the ultimate recognition it has achieved over the years. Along with his immense professional challenges, he also describes the trials and joys he faces while raising a growing family with his wife Amy. By turns poignant, heartbreaking, and charming, Dr. Christensen's story is a gripping and rich memoir of his work and family, one of those rare books that stays with you long after you’ve turned the last page. RANDY CHRISTENSEN, M.D., is a staff physician at Phoenix Children's Hospital. Since 2000, he has been the medical director of Crews'n Healthmobile, a mobile medical clinic that provides primary and comprehensive medical care to homeless children. Dr. Christensen has been the recipient of several awards for his work, including the CNN Heroes award and People Magazine's "Heroes Among Us." He lives in Phoenix with his wife, Amy, also a pediatrician, and their three children. RENE DENFELD is the author of three books, including the international bestseller The New Victorians (1995) and has written for The New York Times Magazine, the Philadelphia Inquirer, and the Oregonian. A passionate advocate for the adoption of foster children, she lives in Portland, Oregon, with her three children, all adopted from foster care. "Dr. Randy Christensen has provided us with a book that is proof positive that there are still heroes among us. These doctors, nurses and social workers labor tirelessly to look after some of our most vulnerable patients - homeless children. In this sensitive and moving portrayal of caring for those most in need, Christensen shows us that it is still possible to make a difference in the world, one patient at a time." "This is a remarkable story of what it's like to be on the front lines of medical care for extremely disadvantaged kids. Dr. Christensen brings to life the realities of America's forgotten and bypassed street youth who struggle to survive. At the same time, this story is a powerful glimpse into the extraordinary work of doctors and nurses who have devoted their careers to caring for people who have no where else to turn." "In 2000, while working at Arizona's Phoenix Children's Hospital, Christensen asked to be assigned a daunting task—leading a mobile health-care unit aimed at serving homeless children. In the world of modern medicine, this was not the obvious way to climb the career ladder toward regular hours and a hefty salary. With a small group of passionately committed providers, Christensen turned this small community-service unit into an integral part of the urban medical landscape. Along the way, he struggled to balance the emotional and psychological demands of treating vulnerable children with the pressures placed on his marriage and family life. Ultimately, the children he encountered on the streets of Phoenix become the real subjects of his memoir, co-authored with journalist Denfield (Kill the Body, the Head Will Fall: A Closer Look at Women, Violence, and Aggression, 1997, etc.). Christensen’s many subjects include: Sugar, the pregnant young prostitute who found her way to new life; the abused and neglected young man who discovered love in a community home; and a mentally ill young woman whose tragic murder resulted in part from the bureaucratic tangles that prevented anyone from truly helping her. The title of the book comes from the bracelet worn by one patient who was unable to tell the story of the systematic abuse that left her homeless. The author provides numerous heart-rending stories, yet, for such a serious subject, the narrative is written with obvious joy and an impassioned optimism for what health-care providers and communities can achieve."